According to the Singapore Companies Act, all Singapore private limited companies must comply with the annual filing requirements to the Accounting and Corporate Regulatory Authority (ACRA) and the Inland Revenue Authority of Singapore (IRAS). 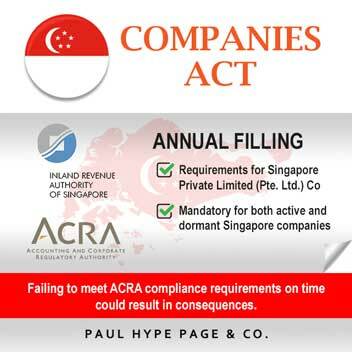 *Annual filings are mandatory for both active and dormant Singapore companies. **Failing to regularly meet ACRA ongoing compliance requirements in a timely manner can have consequences. Every company should hold an Annual General Meeting (“AGM”) either once every calendar year, or 15 months from the date of its last AGM, whichever is earliest. However, companies that have been newly incorporated are allowed to hold their first AGM within 18 months from the date of incorporation. Our accounting and bookkeeping services can ensure that your company is in compliance with the reporting and statutory requirements of various jurisdictions of the region. Our professional corporate specialists can embed process and control systems to capture and report transactions accurately and transparently. We can ensure good accounting practices that ensure comparability and quality of financial information of business units or firms within a business group. Please furnish us with the company’s bank statements for the entire financial period/year. In the bank statements, kindly state the nature of the transactions. The purpose is for us to be able to identify the type of transactions and how to account for them in the best way possible. Kindly refer to the attached bank statements : sample Bank statements with remarks for your reference how to do this. Alternatively you can also tabulate the data in an excel worksheet : Copy of Compilation of bank statements transactions . 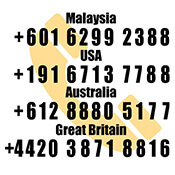 For sales transactions, kindly state the sales invoice number so that we can trace and the status of invoice and also work out the trade receivables balance. *Our corporate specialist will follow up on the work on corporate tax filing after the compilation of financial statements is signed and agreed by the company. A company is taxed on the income earned in the preceding financial year. This means that income earned in the financial year 2016 will be taxed in 2017. You should file your first Income Tax Return when you have closed your first set of accounts. With effect from YA 2010, a company is taxed at a flat rate of 17%on its chargeable income regardless of whether it is a local or foreign company. Corporate Income Tax Returns commonly known as Form C-S or Form C by 30 Nov of each year except dormant companies for which IRAS has waived the requirement to file. Paul Hype Page & Co Corporate Specialists is able to ensure your company fulfill your regulatory compliance requirements when it comes to Singapore’s company laws and regulations. *By complying with regulations, your company avoids not only penalties or legal repercussions, but unnecessary damages to your brand name.